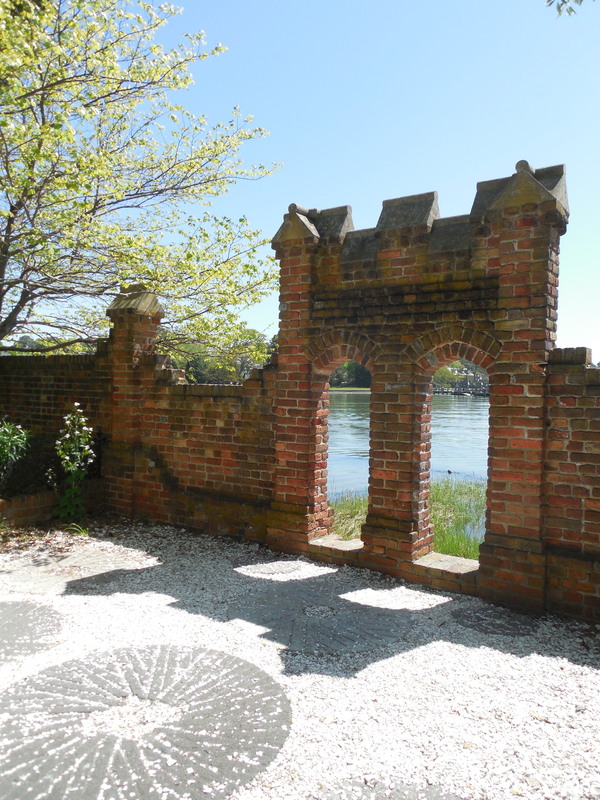 In the 1930s, a red brick wall stood between the iconic Hermitage Museum and Gardens in Norfolk and several hundred feet of undeveloped shoreline. By the early 2000s, the wall marked the edge of the Lafayette River, which had whittled away the shoreline after several devastating storms and increasingly higher tides due to sea-level rise. While sea levels are rising all along the coastal U.S., they are rising two times faster on the Virginia coast. The U.S. Army Corps of Engineers has predicted that the water there could rise an average of 6 inches in the next 15 years and as much as 6 feet by the end of the century. With help from city officials and federal grants, however, Hermitage is reclaiming some of its lost shoreline—and helping to improve Norfolk’s coastal resiliency. In 2018, the National Fish and Wildlife Association (NFWF) and National Oceanic and Atmospheric Administration (NOAA) awarded Norfolk a $1.3 million grant to build a hybrid living shoreline and expand a riparian buffer along the Lafayette River. A hybrid living shoreline mixes low-profile hardscaping with natural buffers. Low stone walls, called sills, are built a distance out from the area to be protected or restored, and the space behind the sills is filled in with sand and planted with native marsh grasses, which stabilize the new shoreline by absorbing waves. Eight living shoreline projects are underway in the Lafayette River watershed, where shoreline and infrastructure were severely damaged by Hurricane Sandy. The work is funded by a grant of $4,640,000 from NFWF, awarded in 2015 as part of the Hurricane Sandy recovery effort. One of these projects is taking place at the Hermitage, where approximately 2636 linear feet of shoreline, including the Lafayette River and its inlets and coves, are being restored. Hybrid living shorelines will help stabilize the property’s wetland areas and prevent erosion of its forested shoreline. The Hermitage donated a conservation easement to the Virginia Outdoors Foundation (VOF) in 2015, protecting the site from being subdivided and restricting impervious surfaces on the 16 acres to just 50,000 square feet. The easement also requires 35-foot riparian protection zones along the river and wetlands. “Permanently protecting the property under easement gives staying power to the work the city is doing along the shoreline and to the work Hermitage is doing to educate the public,” says Brad Baskette, assistant director of stewardship with VOF. The museum teaches the importance of wetlands as a natural resource to fourth-graders, offering hands-on opportunities to explore the wetlands on the property through its Wetlands Enrichment Tour. The funding from the city, along with the guarantee of protection through the easement, makes this work possible. It also has jumpstarted the next stage in the restoration process at the museum, says Hermitage’s executive director, Jen Duncan. “In 2019 we are going to redo our master site plan that considers all of the things that it means to be on a peninsula on the Lafayette River. Thanks to the city, some are being addressed now, but the master site plan will look at requirements of the easement and what we know of the future developments. We will be looking for the areas of the property where we can safely move things out of the way of the river. “It’s a map moving forward, given the realities of Norfolk,” she adds. The efforts in Norfolk got a recent boost from the Commonwealth, when Governor Ralph Northam made addressing coastal resiliency a signature part of his administration’s agenda. He named his Secretary of Natural Resources, Matthew J. Strickler, as the Commonwealth’s Chief Resilience Officer. He also appointed Rear Admiral (Retired) Ann C. Phillips his Special Assistant for Coastal Adaptation and Protection. For landowners who are interested in restoring wetlands on their property, cost-share funding is available through federal programs, several non-profits, and state and local agencies throughout the Bay watershed. Go to https://www.wetlandswork.org/programs-planners for more information, and to search by state for funding opportunities. For cost-share funding specific to the Elizabeth River, go to https://elizabethriver.org/river-star-homes.